A very exciting aspect of worldmusic is that it travels around the world, settles down here and there and get fusioned to something new. A very nice example is the flamenco that is no longer just developed and played in its country of origin Spain, but also for example in Berlin where the band Rasgueo has created its very own thrilling fusion of Jazz and Flamenco with dueling guitar and trumpet melodies. 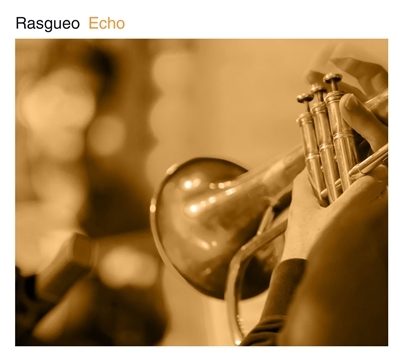 And Rasgueo is an international band headed by the Greek guitarist Nikos Tsiachris and completed by the bavarian jazz trumpet player Martin Auer, Diego Piñera from Uruguay and the double bass player Martin Lillich also coming from the south of Germany. Nikos Tsiachris was born in 1979 in Greece and began playing the guitar at the age of 8. During his university career he got in contact with the Flamenco that he from this point of his life on can’t get out of his mind anymore. When he moved to Berlin for personal reasons, he met Auer and Lillich and together with Diego Piñera the band Rasgueo was completed. A guide to the creation of Rasgueo’s sound was the the piece “Querido Metheny” from Vicente Amigos second album “Vivencias Imaginadas”, although they put the interaction of guitar and trumpet much more in the front of their music. Together with Nikos characteristic compositions the band found its own place within the flamenco scene. Since there acclaimed debut album “Waterfall” Tsiachris and Rasgueo have developed considerably. Nikos released his first solo album „Alcance“ that received the Top of the World award by the British Songlines magazine. After this turn to more classic flamenco, Rasgueo shows with “Echo” a more jazzy sound with complex harmonies. The unisono of guitar and trumpet has already become part of Rasgueos musical language and a nice detail of this album is that every instrument introduces at least one track on the album. The title track „Echo“ was written before the birth of Rasgueo and was originally a solo guitar piece. Tsiachris wrote it in remembrance of this grandmother who enabled him access to a life long gone by many stories and tales. An echo of the past. Generally spoken the compositions of Nikos Tsiachris have a strong narrative character. Most of his tracks are based on a personal story that are written down in the booklet and expressed in a melodic way. The album was produced by Ulf Drechsel, Maria Suschke, Bernd Bechthold and Ulrich Hieber in the RBB Studio in Berlin. This perfect setup was the basis for a fascinating flamenco album that adds new side road to travelling musical genre.